Premium weather data captured by state-of-the-art satellite technology. Billions of people endure unnecessary risk to life, loved ones, and personal property because they don’t have the information they need to prepare for extreme weather changes. All too often, the response to impending weather is reactionary and the result is tragedy. Disastrous typhoons, hurricanes, floods and periods of extreme heat have shown us that weather unpreparedness threatens the safety of millions every day. There is a clear need for more accurate forecasting to enable faster, informed decision-making in the face of weather-driven emergencies. Our data will alter the lives of 5 billion people facing catastrophic weather events. Current weather observation systems are either government run (pricey and highly regulated) or ground-based (offering poor spatial resolution). Our clients rely heavily on the acquisition of accurate, timely weather data to improve the effectiveness of their forecasting, financial modeling, and operations. Despite rapid growth in the data industry, a substantial amount of the Earth’s surface and atmosphere remain under-observed and the standard levels of accessible weather information still lag woefully behind. Businesses driving the global economy need access to better data for better decision-making. We equip our clients with unparalleled space-based weather observation data. 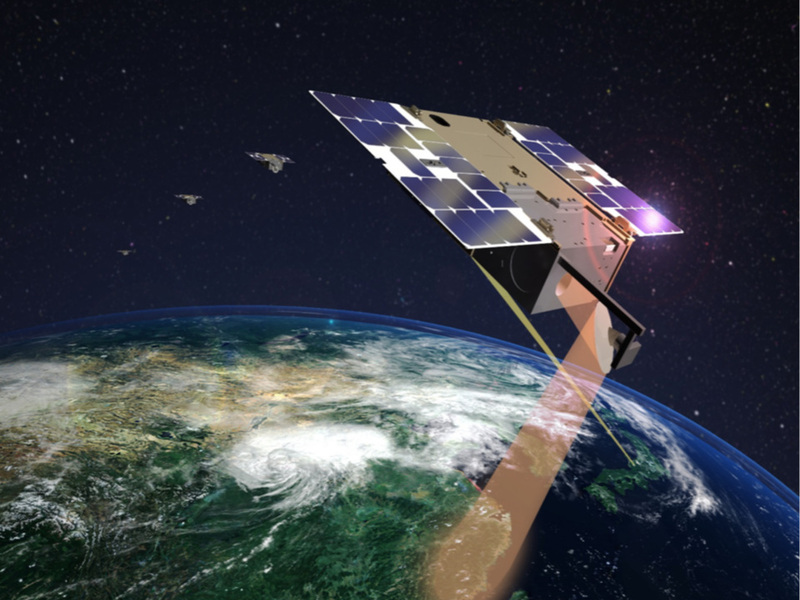 Recent advances in miniaturization have allowed us to develop a low-cost satellite constellation furnished with proprietary state-of-the- art instrumentation. The OMS constellation delivers the most meaningful and timely weather data available on the market, giving our clients the ability to make informed, proactive decisions based on direct earth surface observations. Our custom data sets are produced over six times faster than anything our competitors can provide. We have created a unique commercial alternative to the current supply of weather information. Most satellite data providers are focused on GPS-RO. The OMS constellation utilizes microwave technology to capture distinct temperature and moisture measurements that offer our clients a direct view of immanent weather changes occurring on the earth’s surface. We offer the highest temporal and spatial resolution available on the market, refreshed and delivered every 15 minutes. OMS is a technology leader in space system applications, drawing from an established combination of applied science, space operations, R&D, executive management, and program delivery expertise. A substantial amount of the earth's surface remains unobserved. Our state-of-the-art microwave sensor is the core instrument of our satellites. It observes two channels, water and oxygen. Infrared cameras are focused on temperature wavelength and filtered visible cameras offer NDVI. Primary observation data includes temperature and moisture measurements. These two pieces of information can be combined to monitor a vast array of weather events. The weather data is consolidated at our terrestrial control center. It can be delivered to you via VPN, directly over the web, or in a writeable package. There are a number of other delivery methods. Data can be made available whenever and wherever you require. It may flow internally or be distributed to client-designated rework or analytics partners. The data we provide is used by our clients for financial modeling, catastrophe preparation, risk mitigation, agriculture, transportation, and research. Our proprietary radiometer is second to none. Orbital Micro Systems, 1540 30th St., Boulder, CO 80303, U.S.A.